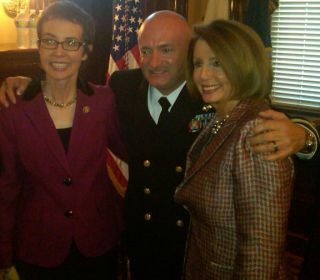 Nancy Pelosi poses wiith Rep. Giffords at Captain Mark Kelly’s military retirement ceremony. Retired NASA astronaut Mark Kelly, the husband of former congresswoman Gabrielle Giffords (D-Ariz.), called for tighter gun control after a horrific school shooting left 27 dead, including 20 children, in Newtown, Conn.
"I just woke up in my hotel room in Beijing, China to learn that another mass shooting has taken place - this time at the Sandy Hook Elementary School in CT," Kelly wrote in a Facebook post today (Dec. 14). On behalf of himself and Giffords, he offered thoughts and prayers to the families of the victims, but urged the public's response to consist of "more than regret, sorrow, and condolence" this time. "The children of Sandy Hook Elementary School and all victims of gun violence deserve leaders who have the courage to participate in a meaningful discussion about our gun laws - and how they can be reformed and better enforced to prevent gun violence and death in America," Kelly wrote. "This can no longer wait." Giffords was shot in the head during a gunman's rampage outside of a Tucson supermarket in January 2011. Six were killed and 13 were injured in the attacks. Since then, Kelly has been vocal about gun violence and critical of lawmakers' efforts to address the problem. At a sentencing hearing for Giffords' shooter last month, he said in a statement to the court, "We have a political class that is afraid to do something as simple as have a meaningful debate about our gun laws and how they are being enforced … As a nation we have repeatedly passed up the opportunity to address this issue. After Columbine; after Virginia Tech; after Tucson and after Aurora we have done nothing." Giffords, who was former member of several congressional committees on science and space, stepped down from politics earlier this year to focus on her health and rehabilitation.